Earlier blog 'Poor Rural Energy access & delivery inspite 'High Need' and 'High Willingness to Pay' discussed the key issues in raising a scalable delivery model for Rural Energy/Electricity. This blog propose a potential model to attend to this cause. All discussions on the model are invited with broad objective to engage with right stakeholders to pilot a workable solution. The growing interest in Rural Franchisees could provide such an opportunity. 1. Energy Mapping: The RESCO Village Enterprise will undertake a detailed energy mapping of the village to identify existing and latent demands for energy products and services together with various potential sources for energy production, in addition to the local demographical, social, cultural and political context for effectively meeting rural energy requirements. 2. Technical/Data analysis: Data from the mapping would be shared with technology solution providers with RESCO Backend to identify optimal technology solution for the village. This overcomes the high search costs for identifying suitable technology for widely varying rural topologies and demographics by amortizing the costs over several projects and solution providers. 3. User centric and unifying role in wholesale and retail: Due to its technology-neutral service provider role and proximity to end users, it will facilitate the delivery of suitably selected solutions and can accommodate both wholesale and retail solutions according to the demands and needs of the rural areas. Once set, the distribution channel can be shared across with multiple products and services thereby reducing the delivery cost to vendors and providing a better pricing to the end users. 4. Facilitating Financing: Owing to its role as a central facilitating agency, the RESCO can function as an information center and risk manager which could potentially reduce the difficulties in obtaining financing currently faced by entities across the energy supply chain. This can be done in co-ordination with local finance partners to assist in securing finance for various stakeholders including end users. 5. Co-ordination with regulatory agency: It will interface with regulators and utilities to facilitate building a favorable environment within which to implement the model and support its power generation and distribution partners. 6. Demand and Supply guarantees: It will minimize uncertainties in energy demand and supply for both its retail and wholesale partners, based upon its collected energy mapping of the area. It will use strategically structured agreements with the generator (or product vendor) to ensure that the required supply and after-servicing demands are met. A similar agreement with the distributor will guarantee sufficient base level demands. 7. Mitigation of O&M risks: It will mitigate O&M risks of the generator, product vendor and distributor via activities such as supporting logistics, ensuring a sustainable fuel supply chain for the power generation plant and catering to after-sales service of the retail products. 8. Training: The RESCO may also interface with a training organization to facilitate recruitment of skilled rural labor and provide a buffer (for its partners and its own local operations) against a sudden loss of trained manpower. 9. Local co-ordination and raising participatory support through awareness: It will interface with local representatives to create an enabling environment where obtaining local information and employing manpower is made easy, thereby allowing its partners to focus on their core competencies. In addition, through its awareness initiatives among customers and assistance in the formation of local cooperatives, it can help speed up the adoption of solutions. 10. Pricing and risk mitigation: By assisting generators and distributors in their pricing and risk mitigation strategies, it will provide the motivation and the level of certainty required for each component of the energy supply chain to remain vested in their endeavors to provide energy to rural areas. 11. Franchisee for utility and local DSM: The RESCO will interface with the utility board in the role of a local or feeder level franchisee, and taking up tasks which may include handling the local Demand Side Management (DSM) DSM and load management. Replacing agri pumps sets with more efficient pumps, bulbs with CFL/LED lights or feeder separation could become some of the DSM activities that it could facilitate (and thereby build its revenue model while interfacing with the utility agency). In its role as an institution interfacing with various energy stake holders - end users, solution providers and the state utility, the RESCO could also become a central monitoring and consumer grievances and reporting agency. 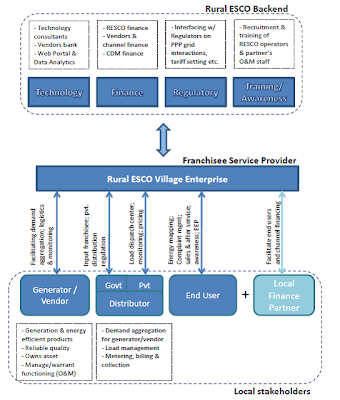 The RESCO model will be a hub and spoke type, branch-based service provider model, franchised to local entrepreneurs in order to create local ownership without requiring a high asset base. It will become a one stop institution for various energy related services to the villages through its role in interfacing with vendors, utilities and end consumers and playing the role of risk mitigator between them for effective end to end delivery of solutions and continuous after-sales-servicing. The above model was proposed by the author while working at IFMR Trust. It has no copyrights, and interested parties are invited to take up learning and put to implementation.